Founded in 2003, Jewish Spiritual Literacy, Inc. is a collaborative project that developed from years of spiritual exploration between forward-thinking rabbis and lay learning partners around the country. 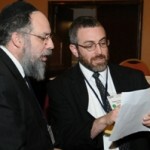 We come from all walks of Jewish life, from the most active to the non-affiliated. Our common denominator is a shared vision of a Jewish People revitalized by ancient wisdom. JSL is a registered 501(c)3 charity. For donation and tax info, click here.